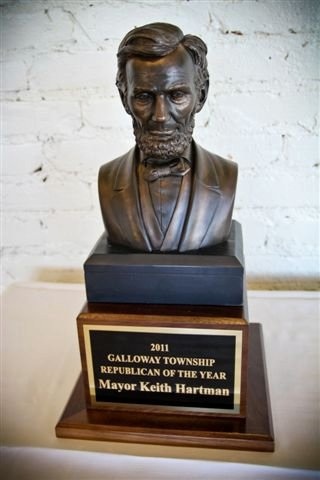 Galloway Township Republican League has announced on their GOP Facebook Page, the 2013 recipient of the Abe Lincoln Republican of the Year Award will be Herb and Patricia Davis. Herb and Patricia are parents to Keith Davis, Atlantic County Republican Chairman. The GTRL has presented the Republican of the Year award for many years. Former recipients include former councilman Jim Cox, GTRL President Jennifer Heller and former Mayor Keith Hartman. Mayor Don Purdy who is a long standing Republican in the community stated, "Herb is a great guy who has done a lot for the community and for the Veterans. This award is well deserved." Herb and Patricia Davis will accept their award on Saturday, February 23, 2013 at the Smithville Inn, between 8:30 and 10:30 a.m. according to the GOP Facebook Page. Former Mayor Keith Hartman also gave praise to Herb and Patricia Davis by stating, "Herb is a nice man and dedicated to the Veteran's cause. They have both always participated in campaign events and are just an overall nice family." Deputy Mayor Tony Coppola did not return comment on Herb Davis. Coppola has worked with Herb on the Veteran's Advisory Board and has spoken highly of him at multiple Council Meetings. Hartman was also a former recipient of the Abe Lincoln Republican of the Year award in 2011. His award was presented to him by former Assemblyman Vincent Polistina. "It's always great to be recognized for your accomplishments." Hartman stated. After a falling out, Hartman who is no longer a GTRL member stated, "I am one of many Republicans in Galloway who have denounced the local organization as a result of it leadership." Hartman who is now a registered Independent says his core beliefs are still consistent with Republican fiscal policies. "My principles have not changed. My leaving the party was based on not wanting to be associated with the local leadership." Hartman stated. Galloway Township Republican League has faced controversy over the past couple years. The GTRL's current Municipal Leader is Terry Lucarelli.